Click on links below to view and hear highlight performance clips. 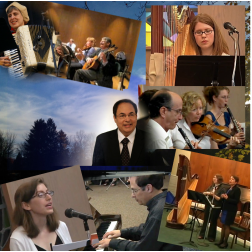 Shalom Aleichem ("peace be unto you") -- A traditional Friday night welcoming melody, with video from an Oct. 2011 concert at Wexner Heritage Village in Columbus, Ohio. Vocalist is Michelle Cohen from Ohio State. Traditional folk/shabbat melodies & excerpts from Mother's Day 2013 Weekend Concert at Wesley Glen, featuring vocalist Cindy Leland.